Whether you're sporty, concerned about what you eat, about your weight, or even if you're diabetic, NutriTab is the perfect partner to balance your meals. This kitchen scale goes beyond the weighing of your food by husking it to give you its entire composition on your Terraillon app. Calories, lipids, carbohydrates, proteins, fibers and sodium, the energy intakes of your food has no secrets for you anymore. You only have to weight them with the smart kitchen scale, to choose them in the ANSES* official database and the app will calculate and give you all details. Thanks to the association with the Open Food Facts database, you can scan your products' barcode to add them directly to your dashboard. All energy data of your scanned product will appear on your account. 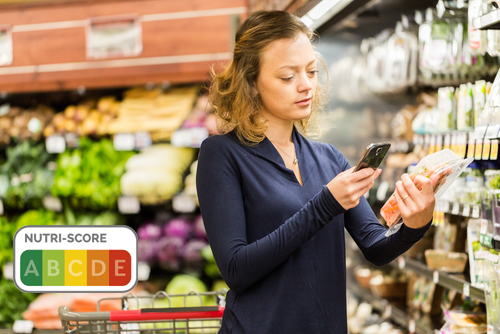 The app regognizes more than 350 000 different products, perfect for a healthy and balanced diet! For an easy reading of the results, the app displays also the Nutriscore. Connected to the Wellness Coach - Health free app, the smart kitchen scale Nutritab helps you to set your goals and reach them thanks to scientifically validated advices. More than a daily help, its large glass plate and anti-shock rubber ring will let you weight large volumes. Monitor your daily energy intakes thanks to the connected kitchen scale NutriTab : calories, lipids, carbohydrates, proteins, fibers and sodium will have no secret for you anymore. You only have to weight your food, to select it in the ANSES* official data base on the Wellness Coach - Health app and it will automatically calculate the intakes of your food. Take care of yourself depending on the information given by the app, whatever your goals or physical condition. Create recipes directly on the app or scan the barcode of the product to add it to your dashboard. Thanks to the Wellness Coach - Health app, set your goals and reach them thanks to scientifically approved and free advices. More than an ingenious connected kitchen scale, NutriTab is also functional; it can weight large volumes thanks to its large glass platform. It is also protected by an anti-shock rubber ring. Fall asleep and wake up naturally !